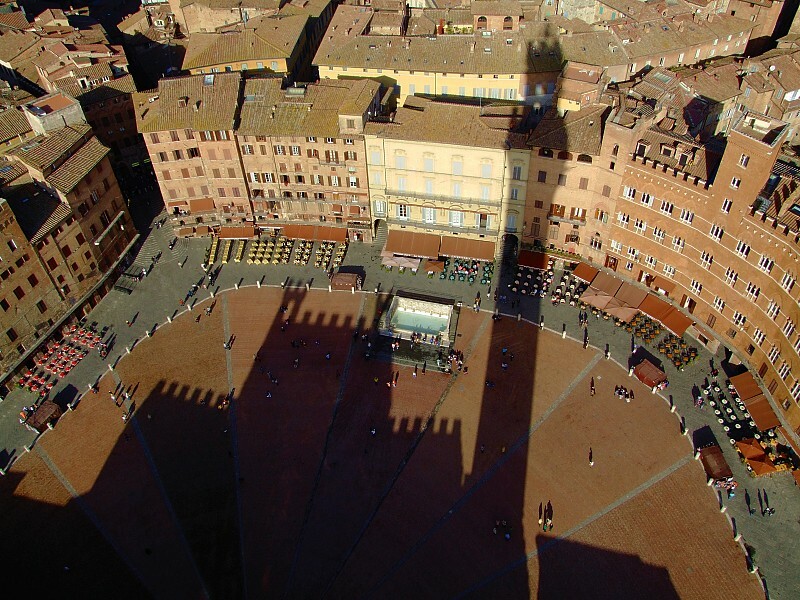 The legend has it that Siena was established by Senius, son of Remus and nephew of Romulus. 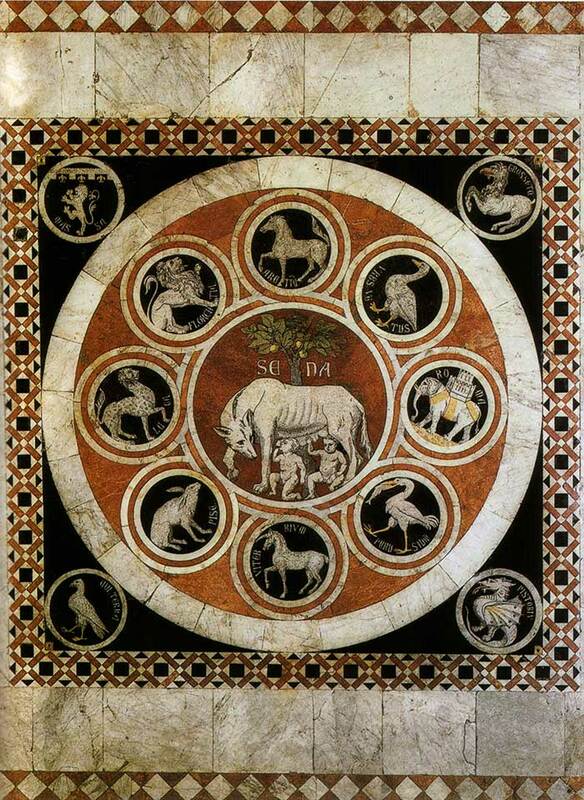 Therefore the symbol of Siena is a she-wolf breastfeeding Romulus and Remus. This symbol has been repeated in different parts of town and pieces of art. 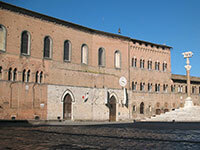 According to a local legend, the city of Siena was founded by a pair of twins named Aschius and Senius. When they were very young, their wicked uncle murdered their father and usurped his throne, so they fled into the forest on two horses, one white and one black. There the two young boys survived by being suckled by a she-wolf, and when they grew up they founded a city called Siena, after Senius; they took the she-wolf as the symbol of their city, and the colors of the horses as their banner. 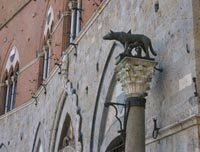 The legend has proved extremely resilient: the she-wolf is a vivid presence all over the city of Siena even today, and the half-white/half-black balzana still takes pride of place as the city's standard during the Palio, the traditional horse race run in the main square of Siena twice every summer. That said, the story will sound eerily — even comically — familiar to readers acquainted with Roman history, since it mimics in almost every detail the famous legend of the founding of Rome (as narrated, for example, in Livy's Ab urbe condita). 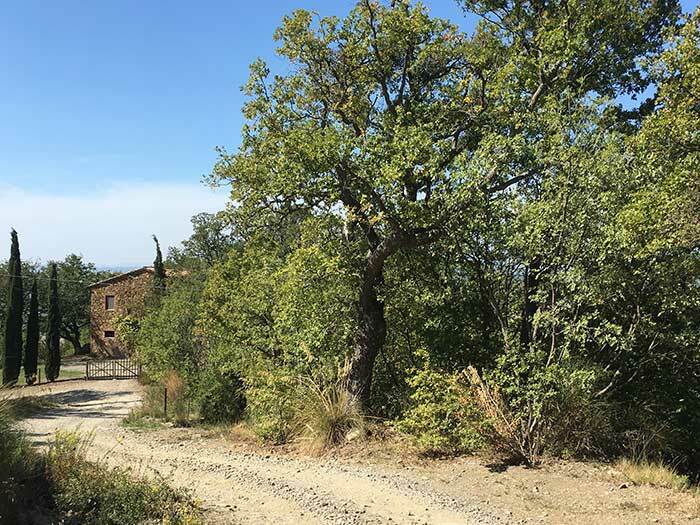 Only the horses are lacking in the Roman version: Romulus and Remus, the heirs of the city of Alba Longa, were hunted from the city by their wicked great-uncle Amulius, who killed their grandfather Numitor and usurped his throne. Abandoned in the wilderness, they were suckled by a she-wolf, and when they grew up they founded the city of Rome. 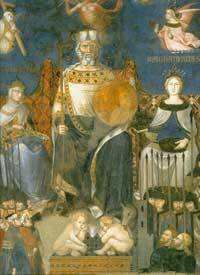 According to the Roman legend, the twins then quarreled, and Romulus killed Remus -- which is where the two legends merge, because according to the Sienese, history repeated itself in the younger pair of twins. Aschius and Senius were the sons of Remus, who were forced to flee because their uncle Romulus had killed their father.